Above photo, from let to right, Anissa Chung, Henry Choi, George Jecminek, and Khristina Blajkevitch. Henry defeated George, 6-4, 6-4 in the Men's Open final, Sunday, July 19. Photo 1: In the Women's Open, Stacey Fung overcame Daniella Silva in the final, 6-1, 6-1. Stacey is posing with John Coupar, Chair, Board of Vancouver Parks; and Sponsor, Leith Wheeler, in receiving a cheque for $1,500. 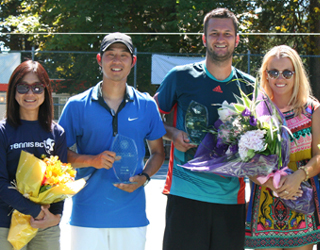 Photo 2: Henry Choi won the Stanley Park Open for a record fourth time. Photo 3: The Women's Open Doubles, from left to right, Daniella Silva, Kelly Mcnabney, Arisha Ladhani and Jena Cheng. Arisha and Jena defeated Daniella and Kelly, 6-2, 7-6 in the finals. Photo 4: Daniella Silva with her mom and sister. Daniella lost the finals in both the Singles and Doubles, but won the Mixed. She and her partner Nick Coutts beat the 20013 mixed doubles champions, Khristina Blajkevtch and Jerry Turek, 7-5, 6-2 in the final. Photo 5: Remember Khristina Blajkevtch? She is the winner of 2009 and 2010 Stanley Park Open. Khristina is now working as the Director of High Performance at Tennis BC. Photo 6: Meet the new Tennis BC Executive Director, Mark Roberts. Note: In the Men's Open, Daniel Chu and George Jecminek overcame Henry Choi and Jeremy Salvo in three set, 5-7, 6-3, 6-2 in the final. Women's 45 Singles not this year!